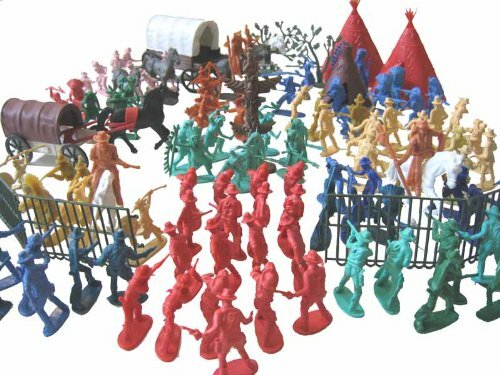 Toy soldiers have been around a long time. I'm guessing as long as there have been soldiers, there have been toy figures representing them. At least as far back as the Roman Empire, the Greeks, the Egyptians...heck, a Chinese emperor had an entire terra cotta army built and buried for him. That guys likes his toys as much as I do! In any case, they've been around. They hit new heights as metal figures (pewter, lead, and tin, so don't chew on them, kids) in the nineteenth century, before becoming part of modern warfare in 1938, and transitioning to the plastic "Little Green Army Men" we know in the 1950s. They're not action figures, they're not painted and articulated, they're just little pieces of colored, molded plastic. 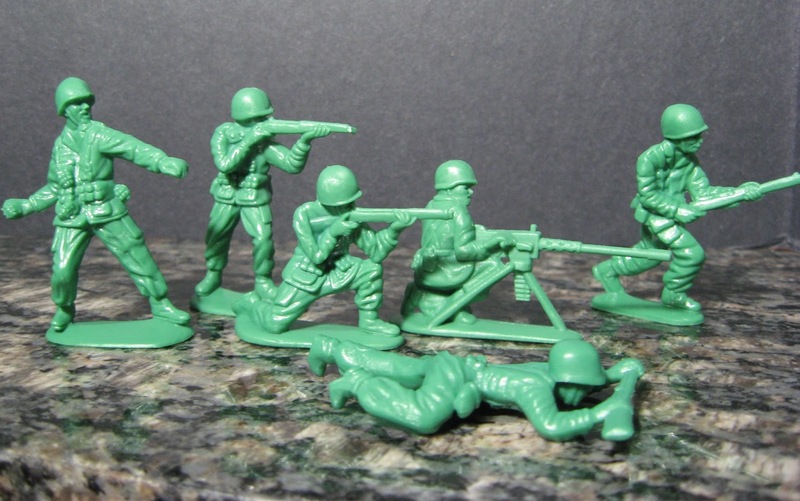 Some companies have been using the same molds since the 1960s, so chances are good that you'll see exactly the same army dudes (and the dinosaurs and farm animals, which is what really triggered the memories) that you played with when you were a pup. Because they're so cheap, they're...crazy cheap. You can amass armies quickly and cheaply, which makes the Little Green Army Men perfect manipulatives for anything involving numbers. For a few more dollars, there are also army men that represent specific conflicts, like the Civil War or World War II. I also really like the Little Pink Army Men...I'm not sure if it's subversive or sending a statement or for Awareness, but they're...cool. 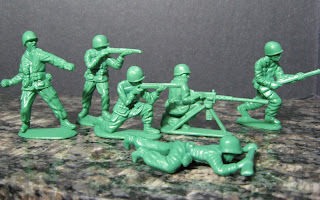 Classroom debate: do Little Green Army Men best represent the values of our nation? Your home state? Your community? When it comes down to it, I'm kind of a hippie. But a really lazy one. So I'm not going to protest or anything, but sometimes the imagery of war gets to be too much. And I'm saying that as a history teachers, who often tentpoles his curriculum around wars. But there are times I don't want to use Little Green Army Men. Maybe I have kids who are agitated by war and guns. Maybe my administration doesn't want me bringing tiny toy guns to school. The great news is, there are a lot of alternatives out there. The "Dollar Spot" near the front of Target stores often has bagged plastic figures for a dollar. They're not army guys, they're red and blue and green superheroes, and pink and purple and teal princesses and fairies, and ninjas--you get more variety than your standard army guys. If you go up in price a little bit, there are bags and canisters and tubes of pirates, zombies, (and still, in 2016) Cowboys & Indians. ...which I'm totally down with using as long they're placed in a historic context. Which is doable. Zombies too. All about the historic context. There are also monsters, and cavemen, and firefighters, and spacemen. Really, just look up TimMee Toys on Amazon, OR "Big Bucket of" and you'll be astounded at the variety that's out there. There are the classic dinosaurs, jungle, and farm animals. I love mixing in dinosaurs with any curriculum, honestly. If they're making a little diorama of the Constitutional Convention, and they throw in a T-Rex as Benjamin Franklin? That's an A+++++ my friend. I mean, he was the oldest member of the convention -- a dinosaur might not be too far off. There have been also some artful takes on Little Green Army Men. 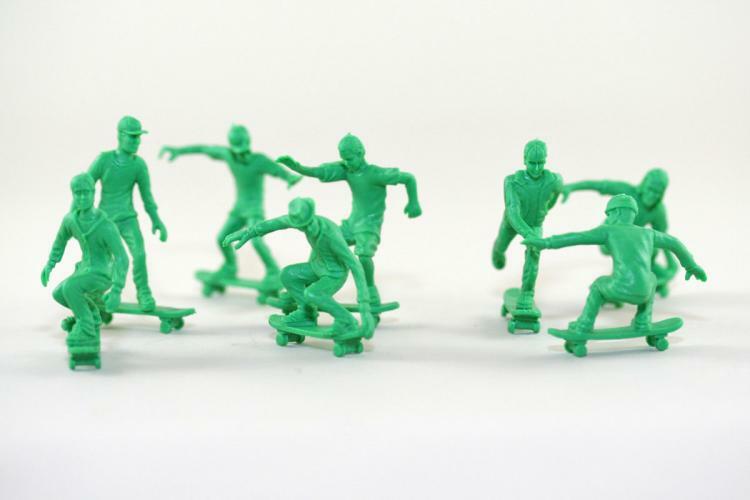 Some of my favorites include the Toy Boarders -- sets of 24 Skaters, Surfers, and Snowboarders for about $8.00. I can name some middle school boys by name (okay, I made one of them) who would do just about anything to be able to use those in a "legitimate" classroom setting. Last, but certainly not least, are the Yoga Joes -- a set of eight soldiers in key yoga poses: Meditation, Downward-facing Dog, Cobra, Warrior One, Warrior Two (appropriate) -- you get the idea. They're fun, they're pricey, they were a gift at the right time from a friend, and they've made me double down on my commitment to yoga and to violence. Two birds, one stone. Namaste. For more ideas on using toys in the classroom, check out Play Like a Pirate: Engage Students with Toys, Games, and Comics -- available at Barnes & Noble and Amazon.